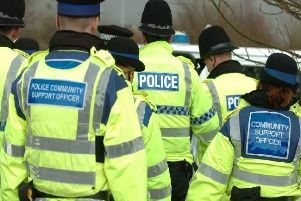 Both council workers and police have been called in to help at St Nicholas Church of England Primary School, in School Road, Marton, while a camera could be installed to help combat the problem. Acting headteacher Claire Taylor told parents in a newsletter that the council and police were there to “look at the issues we have with parking”. She said: “Some parents are still parking in dangerous places, some in prohibited parking areas, and some are letting children out on the mini-roundabout. “Please do not park [or] stop on the roundabout, or leave your vehicle against the barrier to the staff car park. We are lucky to have a large car park at the football club further up School Road, please make use of it – or even park on Common Edge Road and walk your child safely down to school. “I have asked the council to look at placing a camera outside school to help the situation. “The school is concerned that parents parking without due care and attention will cause upset or an accident. “A number of parents have also reported verbal abuse outside of school, in front of children and towards staff. In 2017, people living in School Road and nearby Sandy Lane said fences were damaged and grass verges trampled by parents, and said parking issues have gotten worse since St Nicholas’s expanded in 2009. John Blackledge, Blackpool Council’s director of community and environmental services, said traffic wardens have been patrolling outside the school to “reduce the risk to children due to irresponsible and unsafe parking”. He said fines will be handed out – with cameras also “potentially” being installed.